The AIM NetworkNews and PoliticsBusiness as usual for banks despite Frydenberg’s faux outrage and finger-wagging. 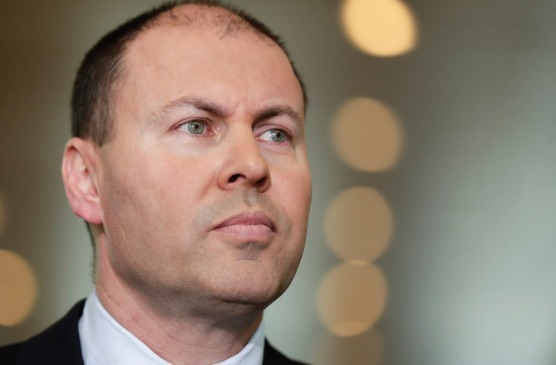 Business as usual for banks despite Frydenberg’s faux outrage and finger-wagging. Our nation sighs with relief this week. Our banks are safe. Federal Treasurer, former Minister for resources and Northern Australia, energy, environment, serial failure and currently unelected Prime Minister, Scott Morrison’s Deputy, Josh Frydenberg, will not get tough on financial companies just because a Royal Commission uncovers incompetence, theft, forgery, impersonation, fee-gouging, usury amongst other criminal conduct while regulators looked the other way. “Getting stuck into banks could hurt the economy”, he warns. Ah, yes. The economy – that lonely little petunia which blossoms on the dung-heap of consumption. As Richard Denniss observes, Australians have been told for decades that as long as the amount of stuff bought is growing we must be doing well. Yet it’s clearly never been the case. The same mentality has the Coalition Monash coal cult calling for us to open new coal mines – if only we could find a single investor. Or even if we have to fund them ourselves in a bizarre hybrid state Liberal/National socialism. While buying more coal, if we could, would “grow the economy”, (another neoliberal nonsense) buying stuff that harms us and harms the planet is not going to make us any better off. It’s what we buy, not how much we buy that matters. But you can’t tell our tyro Federal Treasurer. Keenly attuned to the need to provide the right pastoral care to markets, Frydenberg hints darkly to The Financial Review of the perils of layering new rules on trustworthy institutions such as banks and insurance companies which laboured mightily to sell us harmful products, such as mortgages we can’t afford or junk insurance or even charge us for services they don’t even bother to provide. Either Josh doesn’t know, or he’s wilfully misleading, but Justice Kenneth Hayne QC is not suggesting any new rules. He makes it clear he knows that the banks are bigger than the paper tiger regulators, ASIC and APRA. Why impose new rules that will just be ignored? What’s needed is no new set of rules but the will to impose existing legislation. At present, all banks have had cosy chats with their corporate regulator. As they break the rules, they get a warm inner glow over putting things right by negotiating “Enforceable Undertakings.” Any tiny fine is factored into business costs. Banks agree to sign a statement which says the regulator is concerned they have been bad boys, or rarely, girls. In return, our fearless corporate regulators, the “tough cops on the beat”, which Scott Morrison was only recently assuring us were more powerful than a Royal Commission, simply agree the banks have not really done anything wrong and they agree not to prosecute them. Occasionally there’s a token financial “penalty” thrown in for good measure. Doesn’t this process pre-empt the whole Royal Commission? A get out of jail free card? That’s the whole idea. As Justice Hayne’s three volume interim report makes clear: Enforceable undertakings have been negotiated and agreed on terms that the entity admits no more than that ASIC has reasonably based ‘concerns’ about the entity’s conduct. ASIC has issued infringement notices. But by paying the infringement notice the entity makes no admission. It is not taken to have engaged in the relevant contravention. Yet, ASIC and the Commonwealth are prevented from starting a civil or criminal proceeding in relation to the contravention that caused ASIC to issue the infringement notice. But it’s reassuring to learn that Josh won’t rock the boat. He already knows the ropes. It will be business as usual. Just as it was with all six decades of previous inquiries up to the 1997 Wallis Inquiry report – which led to the Australian Securities and Investments Commission (ASIC) and agreement that “light touch regulation” and the magic wand of market competition would best keep light-fingered institutions honest in a dishonest non-competitive system. At heart was John Howard’s neoliberal fantasy as Bernard Keane describes it, “a blueprint for a free market Utopia based on an ideology of competitive forces, rational consumers and information symmetry and the Howard government’s dream of a shareholder democracy (where ) ordinary Australian workers would be transformed into McMansion-owning, private school- and healthcare-using, investor-contractors enjoying the fruits of unfettered (but taxpayer-subsidised) markets and endless asset price growth. But just to be on the safe side, he blew a mining boom on middle-class welfare. Instead lives were wrecked; ordinary Australians were ripped off; robbed blind, ruined, some even paying fees for services, they never received, plus fees for reviews of their non-existent services long after they themselves had expired. ASIC’s light touch was lightened even further by funding cuts of $120 million over four years in Tony Abbott’s 2014 budget. Scott Morrison’s recent Federal Budget further cut ASIC’s permanent funding by $26 million to $320 million by 2020-21. Staff at the agency have been cut by 30 investigators. What could possibly go wrong? Competition? The banks quickly became an oligopoly, colluding rather than competing. So much more profitable. Oleaginous Josh is a capital chap who sounds in top form as a result of elocution lessons which slow his pace and lower his pitch. The kid gloves are on – no kidding. But have they ever been off? Is our system a world’s best protection racket? Certainly there’s ample evidence of malpractice. Last week, for example, asthenic Kenny Hayne’s Royal Commission into misconduct in the (monolithic) Banking, Superannuation and Financial Services Industry heard that mug punters who trustingly invest their life savings in cash in AMP’s subsidiary NM actually lose money because the firm charges its clients more in fees than they receive in their accounts from interest, or in bankers’ jargon, return on their investment (ROI). Why? Because they can – and because this is what the system is designed to do. In Ken Hayne’s words, it puts “profit before people”. Naturally, as they explain their conduct to the commission, the banks or super funds blame the victim. The exchange is pure Monty Python. If it did not cause such suffering. AMP alone acknowledges to the commission that inappropriate advice by fourteen advisers between 1 January 2009 and 30 June 2015 had resulted in compensation to 1,079 customers. AMP also acknowledges a licensee continued many times to charge a customer fees for services that were not provided. Unfair, unjust or just outrageous fraud? The scam is familiar to millions of us who see account balances steadily decline with annotations on statements such as “fee for service” even when there’s been no service. But at least we are alive. Not content with generously helping themselves to our life savings, banks also charge fees to the deceased while their investment tentacles or subsidiaries cop a blast from Justice Hayne over charging “fees for no service”. “Fee for no service” is one of many modern euphemisms and weasel-words for bare-faced fraud. ASIC defines it as, “… the failure to deliver ongoing advice services to financial advice clients who were charged fees for those services”. The consequences of banks’ behaving badly is staggering – apart from the boost it provides to executive salaries. Some clients commit suicide. Others’ lives are ruined. But my, how investors, governments and banksters love it. Happily, we have the right chaps, and the odd lady chap, in Canberra who see the need to crack on with the racketeering. And Kenneth Hayne’s Royal Commission interim report? It’s a type of post-modern show trial where the guilty pretend to be publicly shamed. Pure performance theatre. Nothing will come of it. Michael West sums up, “Driven by greed, the banks behave with appalling dishonesty. Secondly, bankers exploit their customers for personal financial gain, often behaving illegally. The Australian Securities and Investments Commission (ASIC), is “captive” to those it regulates. Captive also is the Coalition. Fabulist Frydenberg whose heroic failures include doing nothing to fix our fee gouging, planet poisoning coal-fired power grid and the laying waste of vast tracts of countryside, helping kill one world heritage reef, in what is archly termed “land-clearing” amongst other triumphs, is solicitous about the need to spare the rod. Appearing on ABC RN Monday Frydenberg is as quick to posture and wag his finger about the shocking wrong-doing uncovered as he is to find a scapegoat, even if his script does sound like a quick precis of Justice Hayne’s own obiter dicta. “Reading the 1,000-page interim report is one that shows a pretty frank and scathing assessment of the culture, the compliance, and the conduct in the sector. Too timid? Frydenberg overlooks the Coalition’s savage cuts to ASIC’s funding. Or is this a case of psychological projection of his own mentality? Oddly Sabra doesn’t ask him about the nearly $150 million or the staffing cuts which have crippled the corporate watchdog to the point where it’s not even able to bark, let alone bite. What have you said to ASIC’s chief James Shipton and APRA’s Wayne Byers about muscling up? JOSH FRYDENBERG: Well, I’ve said that the public expect them to do better, and we, as the Government, stand ready to provide them with the support that they need. SABRA LANE: But it’s clear that the banks and the financial institutions just didn’t fear being… You know, they just didn’t fear any consequences at all, that they regarded these watchdogs as toothless chihuahuas. Hayne’s final report is due February 2019 and will include his findings on superannuation, insurance. It will also contain his recommendations, which can include recommending criminal prosecution. What is clear, nevertheless, from the Coalition’s responses to a Royal Commission it vigorously and repeatedly opposed twenty-six times is that this government is happy to proceed with the theatre of its thoroughly post-modern show trial – even comply with a few token prosecution as long as it leaves the rest of the highly profitable and rotten edifice intact. Above all, it shows itself firmly wedded to John Howard’s neoliberal vision of the past and as much in thrall to the powerful banks as any Coalition government. David will be taking a break to undergo coronary bypass surgery. He is looking forward to returning to writing as soon as possible. Hoping all goes well with your operation David – wishing you the very best from an avid and appreciative reader of your inestimable writing. Good luck – but feel confident. Heart attack in May in early morning. Wife’s effective resuscitation effort before ambulance intervention which delivered broken ribs, torn cartilage and the like and then a coma for a few days. Defibrillator inserted. Late August saw enough recovery to allow for a triple bypass, in ICU for a few days, but discharged 8 days later. Needless to say, I appreciate your insights, points of view and subsequent writings. Wishing you all the best David. Definition of the Right and the Left political thinking. The Right is “how do I get more”. The Left is “how do I hang on to what I have”. SIMPLE! Best wishes on a speedy recovery David. Like all our readers, I so look forward to your articles. You somehow do the impossible job of making reading about politics enjoyable. Take care and rejoin us when you are able. Recover quickly and easily David. Good analytical journalists are few and far between in the MSM which is the reason we read AIMN articles, and particularly enjoy your contributions. As always with any LNP pronouncement, policy, action – or inaction – all one needs to do in order to make sense of it is… follow the money! Good luck with your medical procedures David! Great article, as usual. Sadly, this sad & sorry excuse for a so-called “liberal” politician is yet again proving to be yet another of the lying, flat earth, right wing wankers who are supposedly “in charge” of this country! I doubt that there are many people in Australia who do not want to see anything done for all the banks/financial businesses etc that have lied, cheated & behaved as criminals towards we taxpayers. ALL these bastards should be jailed, heavily penalised & made to never again be in charge of ANY of our banks or financial businesses etc. Maybe then we will see that they have been given “just rewards” for all the crooked etc things they have been & are still doing to us. Every good wish for your operation and speedy recovery David. We will miss your brilliant running commentaries! The sawbones are getting pretty good at this kind of stuff, so I expect that you will be up-and-at-it sooner than you might imagine. Wishing you all the very bestest. All the best David for your upcoming surgery. With you off the scene for a while, I don’t know where I’ll turn for the intriguing political analysis that you provide on a regular basis. All the best! The great lament is that ‘the fix’ is already in. Ian McPhee was appointed by the Banker’s Union, the ABA, in 2016 to preaddress all of our concerns. Naturally, this was at a time when our politicians were stalling the establishment of a RC. There is absolutely no point in having a RC into a political problem if you haven’t already got a political fix. There were some hiccups along the way. The ABA enquiry into themselves was all but complete when they told then PM Turnbull it was in order for him to proceed with a RC. The final report, released in April, 2018, addresses all of the problems likely to be posed by the RC findings. There were no interim recommendations by the current RC, unlike that other RC into the employees unions. The tame RC into the untamed banks is a perversely converse arrangement to the untamed RC into the long since emasculated and thereby tamed unions. Responsibility for financial malfeasance? Contribution to the GFC repercussions in Australia? Too big to fail? Exceeding ‘interest only’ loan ratio’s on their books? There are a lot of things you could look at in the banking industry if you were interested in genuine reform for the customers benefit and for the national financial security. The tame RC has already started the narrative that the ‘regulators’ have been very, very naughty. The government’s complicity in defanging the already tamed regulators barely rates as a bi-line. ‘Show trial’? Merely another pantomime performance by performers so weak their only aspiration is to the lofty heights of the muppets. That they would ever be so accomplished is a consideration beyond their grasp. Without meaning to make light of your situation, it should be pointed out that a by-pass of the heart is only one criteria for parliamentary inclusion. If your surgeon suggests a lobotomy, you would do well to ask if they are recruiting for the IPA/LNP. Monday mornings are going to be quite empty for a while. All the best regarding your upcoming procedure David , hope all goes well with a quick recovery mate. Adding my best wishes as well. Great success rates with what now seems to be a pretty routine procedure. Not sure whether it was the missus or the Ambos who cracked the ribs but they kept you alive. Good job. Speedy recovery David, you will be missed, I enjoy your posts written about serious issues yet they always manage to put a smile on my face…. I too enjoy your writing David and wish you all the best with your operation and recovery. I have a friend who has recently undergone a huge heart operation and has pulled through brilliantly, however she has been told that recovery will be 6 to 12 months. So please mate, take it very easy when you are in recovery mode. The banks are the tories mates they know a dressing down from any real action. Commissioner Haynes is also a Liberal and in his interim report he has not recommended charges be laid against anyone, this after the scandal we heard about selling dead people insurance and the like, what a scam! As they like to claim, the Liberal Party is a braod church. Eventually perhaps, the genuine liberals will retrieve the Party from the right-wing, neo-fascist organisation that it has become. Not that their recent national gathering would indicate that there is much hope of that happening before the Earth overheats and hell freezes over. And we are headed for a housing price collapse very soon; so lets see how the banks handle that?